RACE RESULTS ARE POSTED HERE! Congratulations to all the runners who came out to the 40th running of the January Thaw 4.5-Mile Road Race on January 27. Ron Peck (27:28) and Pamela Lattin (33:17) were the top male and female finishers, receiving $50 gift certificates from New Balance. Full race results are here. Established in 1975, the Central Maine Striders running club is the oldest, active running club in Maine. The club is open to all interested runners and serves runners of all ages, abilities, and interest levels in the Central Maine area. Our members have a variety of running interests and experience levels, from recreational running to competitive racing. They run on roads, trails, and tracks and at all distances. Our mission is to build and support the whole Central Maine running community, while helping our members live active, healthy lives. Join us! Get involved in the local running scene, or just meet fellow club members. All are welcome. Show your Central Maine Striders pride by wearing a club singlet, tee, or hat at an upcoming race or run. The club has partnered with Atayne, a Maine-based company that makes running clothes in the USA, to set up a Central Maine Striders apparel store. 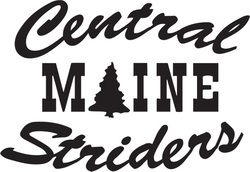 Central Maine Striders is a member club of the Road Runners Club of America.